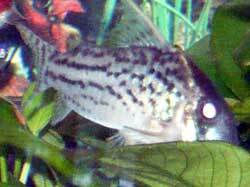 The Schwartzi cory is one of the many varieties of Corydoras species. It is of the regular size for the cories, which is about 2.5 to 3 inches. 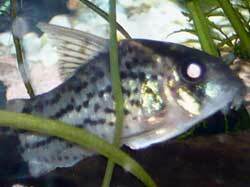 The Schwartzi cory also has relatively the same preferences for water parameters. These little fish like neutral water, 6.5 - 7.5 for the pH, the water being soft and the temperature around 71 - 75°F (22-24°C). They come from the rivers of Brazil. So they prefer a well planted tank that has lots of hiding places. Their home should be at least 10 gallons for a school of just 3 cories. These fish, if cared for properly, will live to around 3 to 5 years. Since these are social little fish, they like to be in a school of at least 3 of the same species. If you want to have multiple cories in the tank, then try and have at least 3 of each species. Most species prefer the company of their own species, but if they have none of their own species, they will school with other species. These fish have such a peaceful nature, the C. schwartzi can be put with many different fish, except larger cichlids, and any other fish that are big enough to eat the cory. These cory cats are hard to spawn in the home aquarium, but if you are able to spawn them, it is very rewarding, because these fish usually go for about $7 to $10 a piece in the local stores. Breeding : Breeding them can be difficult in the home aquarium. Tank Mates : Anything that will not eat them or harass them too much. Diet / Fish Food : Bottom feeder, they scavenge the food off the bottom of the tank. Supplement their diet with Algae Wafers and sinking Shrimp Pellets fed at night. Tank Region : Lower-bottom of the tank with the odd time of spawning surfaces being along the glass of the tank. Gender : Females are larger and rounder than the males of the same age. 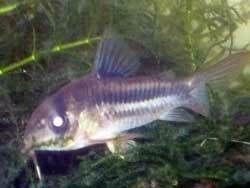 Comes from the rivers of Colombia, South America and has similar care requirements as other corydoras species. Also known as the bushy nose pleco, the bristlenose pleco is a much better option for most hobbyists instead of the common pleco (below). A popular cory cat, does well when kept in groups of 6 or more.